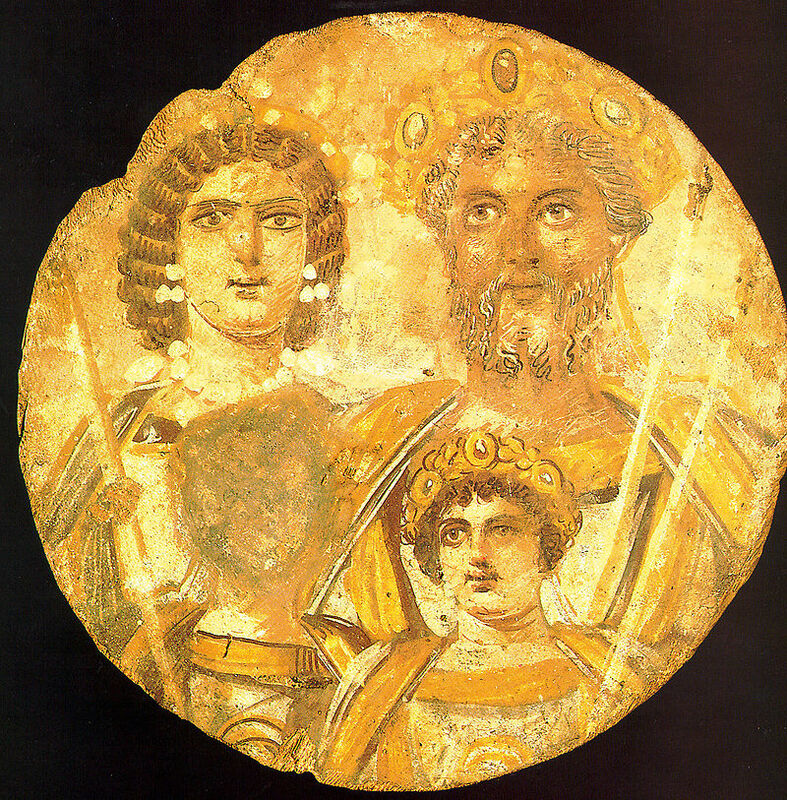 Tondo showing Septimius Severus, his wife and two sons. Geta’s face has been removed (Staatliche Museum zu Berlin). Septimius Severus died in Eburacum on 4 February. It had been clear for a while that the emperor had been living with one foot in the grave. Herodianus claims that Caracalla tried to persuade the medical staff to be negligent in treating his father, so that he could get rid of him faster. It is quite possible Caracalla indeed did nothing to improve his father’s health. When Severus died, Caracalla and his brother Geta were to jointly rule as Augusti. Before he closed his eyes for good, Severus is said to have instructed his sons to “be harmonious, enrich the soldiers and scorn everybody else”. The first part of this instruction was going to be problematic. As the brothers had no intention of continuing the war, they made peace with the Caledonians and prepared to send Severus’ remains back to Rome. The emperor was cremated and his ashes were collected in an alabaster urn, together with fine perfumes. Dio reports that Severus had held the urn shortly before his death, and had said: “Thou shalt hold a man that the world could not hold”. Mosaic of the Blue circus party (Museo Nazionale Romano, Rome). Caracalla and Geta were back in the Eternal City by May of this year. They had with them the urn that contained the ashes of their late father and placed it inside Hadrian’s mausoleum, where Severus’ “father” (i.e. Marcus Aurelius) had also found his final resting place. Severus was deified in a lavish ceremony (apotheosis), of which Herodianus has left us a vivid description. Although the two brothers worked together in giving their father a place among the gods, they were certainly not getting along well. They basically lived in open hostility and were constantly plotting against each other. Each surrounded himself with supporters and it seems that most of the nobles supported Geta, who was deemed to be modest and benevolent, and who resembled his father closely. The brothers also supported different parties at the circus games, with Caracalla supporting the Blue party and Geta the Green party. Herodianus presents an interesting story in which the empress-dowager, Julia Domna, tries to reconcile the two brothers. This leads to Caracalla and Geta drafting a plan to split the Empire into two parts, with Caracalla ruling the western part, and Geta the east. The Propontis was to be the border between the two realms. Nobody dared protest, except for Julia, who by employing a parable rebuked the boys for cutting their mother into two. After her intervention, the plan was ditched. It is impossible to ascertain whether or not a plan like this was ever really drafted to divide the Empire between the two brothers. It is not impossible, but in any case such a division was soon no longer relevant, as Caracalla killed his brother in late December of this year. Remains of the so-called Tomb of Geta along the Via Appia. Dio writes that Caracalla had planned to assassinate his brother during the Saturnalia (17-23 December), the festival that put Roman social hierarchy on its head for one week. He was unable to do so, however, and then persuaded his mother to invite them both to her quarters, alone and unarmed. Geta did come alone, but Caracalla had taken several men with him. Geta was killed in his mother’s arms and Julia was all covered in her son’s blood. Caracalla immediately tried to win the support of the praetorians. Taking the palace guard with him, he hurried to their camps, exclaiming all the way that his brother had tried to kill him. The praetorians probably had a hard time believing his story and soon the truth was known to them. However, Caracalla offered them a donativum of 2.500 denarii each and also raised their pay. It was enough to win the hearts and minds of the soldiers. In the end, they declared Caracalla sole emperor. Geta was posthumously declared an enemy of the state (hostis). Now Caracalla still needed to be accepted by the Senate. This was a formality. The young emperor went to the Curia surrounded by a mass of heavily-armed praetorian guardsmen. Although there was strong opposition in the Senate and many senators had sympathised with the late Geta, no senator dared speak out against Caracalla’s actions. – Historia Augusta, Severus 19. – Adrian Goldsworthy, The Fall of the West, p. 69-71.